Hunting is a passion for some and a profession for some others. But hunting is a serious venture and needs proper training and equipment. You can’t simply go in front of an animal and start shooting at it. Most of us would never resort to such activities, but if one wants to start hunting here are some basic hunting tips. Beginners can be better off using these tips to help get them started. There are certain rules that hunters should follow. Hunting is more suitable for only some periods in a year and at a certain time of day. You should not play your games at night or in the morning. You can come early at the spot and familiarize yourself with the environment. Don’t shoot until the sun comes up. It has been reported that late afternoons are good times for game. So no matter how early you come don’t stop shooting till the last rays of the sun are about to disappear. This is especially important in deer hunting because the deer need to adjust their eyesight to the changing light at he time. This makes it difficult for the deer to see you. These where some basic hunting tips. It is very important to smell neutral while going hunting. The deer may smell the different smell and be alerted. The most important thing to remember is to stay quiet. For some it is instinctive but the others need to really keep their mouths shut and stop rustling. You should adjust your clothing according to the weather. You should carry extra clothes with you so that you can change clothes to suit the weather. The shoes or boots that you wear must be suitable for the terrain. They should keep you comfortable and dry. You should also carry a GPS system even if you know the area well. The most important but overlooked pieces of hunting equipment is toilet paper. This is not a joke, but in fact a very important basic hunting tip. Hunt at specific times of the day. You should adjust the time according to the animal’s characteristics, an example i cited earlier was that deers need to change their eyesight during evening and so this is a good time to shoot them. Smell neutral and don’t reek of cologne, soap or perfume. Keeping quiet is very important. You should not just stop talking but you should also stop breaking twigs or rubbing shrubs. You should adjust your clothing according to the weather in which you are going to hunt. By making use of some basic hunting tips you will do so much better on your hunting expeditions. 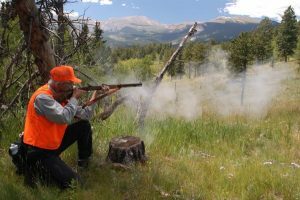 Try accompanying professional hunters to learn more hunting skills and techniques. Happy hunting.